I haven’t updated this site in over 3 months. That was very remiss of me, but it wasnt because I haven’t been busy. I have been busy. So this is a quick update of where things stand. Firstly, it was great to hear from editor Andy Cox recently, who told me that my short story, APPORTS, would be published in (probably) the September issue of Black Static magazine. This is my second appearance in the fantastic British publication, and the first since it changed format to a smaller size. Needless to say I’m looking forward to it immensely. The tale is an extremely dark ghost story. 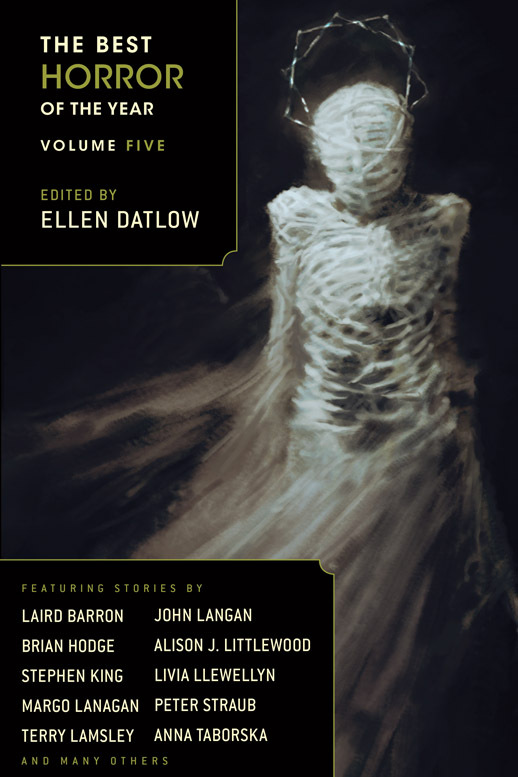 Secondly, I heard recently from Ellen Datlow, who advised me that The Best Horror of the Year 5 – in which my story NONE SO BLIND will be reprinted – has had its publication date pushed back to September. This is due to the takeover of Night Shade Books. Whilst its delay has been frustrating, at one point there seemed a very real possibility that, unless the new contracts could be agreed, the series would be cancelled. So I’m glad to see it has all been resolved and things should continue. Thirdly, my latest story, RAPID EYE MOVEMENT, is due to be published in Joe Mynhardt’s Crystal Lake Publishing anthology, Fear the Reaper. There are some great writers involved in this project, too. I’ll post more information a little closer to the time. Fourthly, I need to say that I’ve seen the artwork that is due to grace the cover of Crimewave 12, out soon from TTA Press. It’s a superb piece of work. My story, WHAT GRIEF CAN DO, will be published in it, alongside many wonderful award-winning writers (and many of my literary heroes). Fifthly (is there even such a word?) my story DOUBLE HELIX will appear in the Ill at Ease 2 anthology, due out on 1st August. Published by Penman Press it will sit alongside stories from six other great writers – Shaun Hamilton, Robert Mammone, Val Walmsley, Mark West, Sheri White, and Neil Williams. Neil has done the stunning artwork. I’ll post a link as soon as I have it. And finally I can report on something that I’m working on currently. It’s a novella that I long ago promised to write for Hersham Horror Books. The boss, Peter Mark May, has been unbelievably patient so far, and I finally feel confident enough to speak about it. So far it has the working title, LAUDANUM NIGHTS, and it’s shaping up to be a crime/dark fantasy crossover set in a pseudo-Victorian city involving a kidnapped child, dolls that move by their own accord, and a mysterious fiend that never ages. More information once it develops. I’ve also received invitations to contribute to several anthologies, all of which are due out next year. The temptation to try for these slots is too strong, so I’m working like crazy to make sure I give those submissions my best shot, as all three books are ones which I’d give my left eye to appear in. Again, more information as soon as I can talk about it. Still no news on when my story, THE CAMBION, will be appearing in Cemetery Dance, although they seem to be back on schedule so I expect it to be sometime next year. Like I say, what an honour – and I’m thrilled to be even mentioned in such company – but I won’t be holding my breath. Still, I feel it’s a great achievement. I’m very happy with the direction my writing is going and – after all is said and done – that is the only thing that matters.